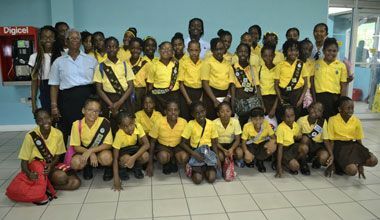 The group, which left St Vincent last Saturday, July 18, from the ET Joshua Airport, was accompanied by five Guiders and two Girl Guides. Jacqueline Soso-Vincent, commandant of the camp, said that this yearâs theme is âBe prepared to strive beyond expectation to achieve your goalsâ, and she noted that educational camps are âbeneficialâ to both the children and the leaders. âThe adults get to know the girls better and the girls get to learn new things, see new places and undergo new experiences,â explained Soso-Vincent. The Brownies come from Tourama Government School, Sandy Bay Government, Langley Park Government, Marriaqua Government, Sion Hill Government, Lodge Village Government, St Maryâs Roman Catholic School, Windsor Primary and Questelles Government. In addition to the aforementioned activities, the group â which is staying at a primary school in Castries â will also visit Morne Fortune and Pigeon Island, and will experience water tubing in a river. Soso-Vincent further explained that for many of the Brownies, this is their first camping experience â with a few of them having attended previous camps that she has led. Coincidentally, Soso-Vincent â who has been involved in Girl Guiding for several decades â took her first group of Brownies camping abroad to St Lucia in 1969/70. Soso-Vincent also said that she takes great pleasure in hearing reports from the parents of children who have camped with her, detailing how their behaviour has changed for the better after returning from camp.